Ed Agopian has been in the coin business for decades. At his shop in downtown Hamilton, he's just made the biggest find of his career. The penny, as every Canadian knows, is dead. At the cash, they round down, they round up. And the smallest piece of change you ever get back is a nickel. It’s as if the penny never existed. Now the Mint is melting those cast-off coins by the millions. But before the last one’s gone, here’s a story about how one guy hit the jackpot by watching his pennies. 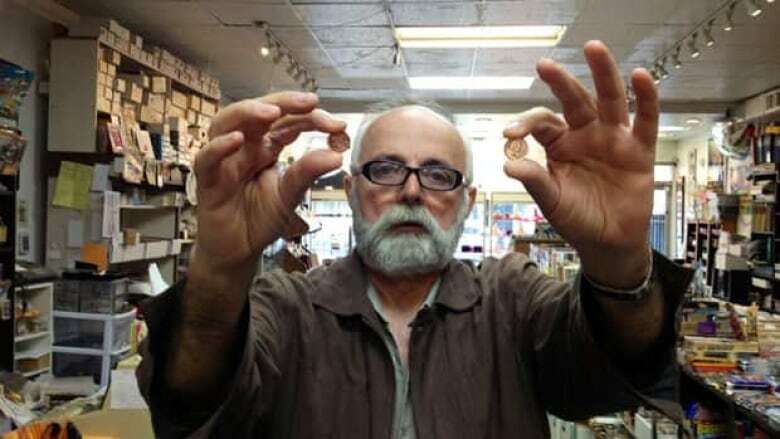 His name is Ed Agopian, proprietor of Imperial Coin and Stamp on King East downtown. He’s 62 and has been in the coin business 35 years. I met him last summer. I had a 1976 Montreal Olympics gold coin. With new gold-buying shops everywhere, I wanted to see what they’d give me for my coin. Long story short, two places offered me half what the coin was worth. Only Ed knew the right value of my coin, and he knew it in an instant. I wasn’t selling, but it was good to meet a man who knew his trade. Back to Ed’s big penny prize. It was a slow day at the shop and he decided to go through pennies he’d bought from the bank back in 2006. They were brand new, because there’s a market for that. Just recently, Ed sold somebody a brand-new roll of fifty 1955 pennies for $135. Anyway, he was going through those shiny 2006 coppers. Fifty pennies to the roll, 50 rolls to the box, two boxes – 5,000 pennies in all. The mint had been putting out two kinds of pennies – ones with a zinc-core that a magnet won’t pick up, and ones with a steel core, that a magnet will pick up. Ed’s batch was magnetic. And he noticed something was missing. Those 2006 magnetic coins were supposed to have a little logo on the flip side, right below the image of the Queen – either a P, or the brand-new Royal Canadian Mint crown/maple-leaf logo that’s now on all coins. Ed knew there’d been an error that year, and that some pennies rolled out with no P, no logo. He knew they were rare. But in the first roll of 50 pennies Ed opened up, there were a couple with no logo. He opened another roll, and another. By the time he was done, he had turned up more than 500 no-logo coins. And yet, the respected International Coin Certification Service – which doesn’t sell coins, just grades them – had only 290 on record until Ed’s find. If you discover a 2006 magnetic, no P, no logo specimen in your penny jar, you might get $50 for it. But the real prize is for uncirculated coins – factory fresh, mint condition. And on eBay, one of the uncirculated pennies recently sold for $500, uncertified. Ed’s are certified, and he’s going to sell them for $635. Setting coin prices is a mysterious art. But if Ed can move all his no-logo pennies at the asking price, his discovery is worth more than $300,000. He says he’ll divert a little piece of the action to McMaster Children’s Hospital. Funny thing. Ed had a robbery at the store in 2006. The thieves scooped up rolls of dimes, quarters, dollars. They didn’t bother with Ed’s pennies. Ed is about to flood the market with a lot of no-logo magnetic pennies. He doesn’t think that will diminish the value, and is going to stay firm on price. He’s in no hurry to cash out and go on a spending spree. "My wild days are over."